Webcam spying has become increasingly scary. You might say that Macs are completely safe because the webcam has a nice little indicator light that turns on when you are recording. However, this isn’t the case. In some older Macs, there is software built to disable the camera light completely. Even though this happened about 10 years ago, the scary thing is that there’s a setting that’s built-in that changes the brightness of your screen by using the light sensor. The ‘Automatically adjust brightness’ feature uses the brightness level from the light sensor, while somehow keeping the LED off. 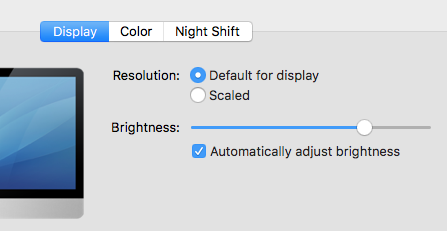 If you’re reading this on a Mac and have this setting enabled, you can place your hand over the light sensor right now and watch the screen go darker. The LED never turns on during this. This means that macOS is at least capturing some data from your surroundings and it is doing so without the little light going on. Restart the mac, and hold down Cmd+S during the boot process. You’ll be greeted with a black screen full of white text. type ‘sudo reboot’ and finally press enter a third time. Follow the ‘Welcome to your new Mac!’ setup screens and allows you to create a new admin account. This method essentially tricks the computer into thinking that it’s being set up for the first time. All your files are still intact, except you now have a new user account under your control. I don’t think I have to say that being able to rip a mac out of just about anyone’s hands and add an admin account is scary. 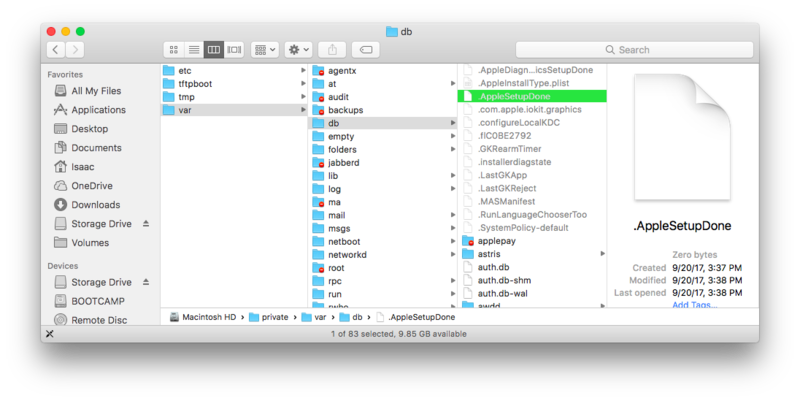 The mysterious ‘.AppleSetupDone’ file. Make this vanish and you have the ability to add an entirely new admin account without permission of the owner. If you own a Mac, I bet you’re pretty terrified right now. If you’re running a Mac that is part of the 98% or so that don’t have a firmware password, you are at risk. If someone steals your laptop, they have access to all of the information on your computer. But, Apple wasn’t just about to leave a gaping hole in their system. If you’re interested in blocking these kinds of attacks, try setting a firmware password. Note: If you lose this password, you’ll have to take your computer to Apple to get it fixed, but that’s a small price to pay for peace of mind. Restart the mac and hold down Cmd+R during the boot process. Follow the nicely-designed application that apple intentionally and purposefully created to reset your password. Keep in mind that you don’t need authorization to do this. The only caveat with this method is that if you have an Apple ID linked to your account, you’ll need to use that to reset your password. However, there are many other ways of resetting passwords (and some of them are pretty easy) than I have described here. For apps that are downloaded from places other than the Mac App Store, developers can get a unique Developer ID from Apple and use it to digitally sign their apps. The Developer ID allows Gatekeeper to block apps created by malware developers and verify that apps haven’t been tampered with since they were signed. If an app was developed by an unknown developer — one with no Developer ID — or tampered with, Gatekeeper can block the app from being installed. I think that’s why a lot of companies don’t want to have to find a lawyer just to publish an App. I certainly wouldn’t. And then there is malware that easily bypasses gatekeeper. Apple is making everything harder for developers, while letting basic malware like this one slip under the radar. What’s worse is that Apple introduced the ‘Auto Rearm’ feature to Gatekeeper in Yosemite, meaning that it turns on after 30 days of inactivity. Luckily, it’s possible to disable this ‘feature’ by using the Terminal. However, the Terminal can be very scary to some Mac users. I have two tips for you. The first is to set a firmware password on your Mac. This protects against all of the password-reset methods that I know of. The second is to enable FileVault. This encrypts your hard drive and makes it so no one can look through your storage volumes.